Five generations of Barnard alumnae were represented at a panel event as part of the Bold, Beautiful, Black @ Barnard series Tuesday night. The panel was one of several events held this week as part of Bold, Beautiful, Black @ Barnard, a three-day celebration of black students held from March 26 to March 28, hosted by the Barnard Student Government Association and Barnard Student Life. The panel was organized by Phanesia Pharel, BC ’21, moderated by Gladyn Innocent, BC ’14, and featured Frances Sadler, BC ’72 and a member of the Barnard Board of Trustees, Cynthia Groomes Katz, BC ’86, Binta Brown, BC ’95, Cindy Similien-Johnson, BC ’07, and Jada Hawkins BC ’16. The panelists focused on generational themes of black identity at Barnard by addressing why they chose Barnard, their expectations of Barnard before attending, and the significance of their black identity while they were students. They also offered advice to current students in the audience. 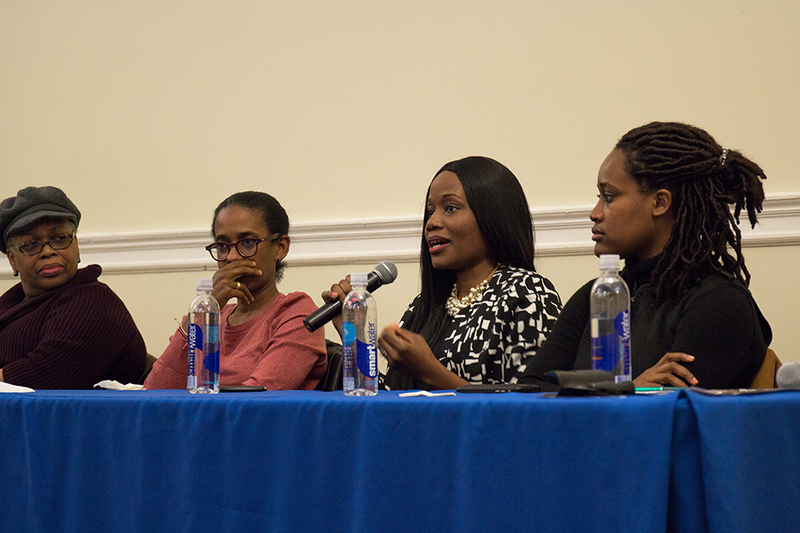 Many of the panelists were attracted to the caliber of Barnard’s academics and the culture of women’s empowerment when considering where to go to college. Brown, who is the CEO of Big Mouth Records, said she chose to attend Barnard in part because she believed her identities as a musician, writer, academic, and black woman could all coexist at Barnard. Similien-Johnson, founder of CSJ Media Publishing and writer of the blog “Goal Chic,” said she chose to attend Barnard because she wanted to be around women who were committed to exploring their dreams and would give her the empowerment to do the same. All of the panelists agreed that education was heavily valued in their upbringing regardless of whether they came from families where previous generations had attended college or where they were the first in their family to attend. “To be the first one in my family to step foot in a college environment was something profound,” Similien-Johnson said. The alumnae underscored the prominence of their black identity while they were students at an institution that has been historically predominantly white, and still is today. While 44 percent of the class of 2021 identified as nonwhite, only 7 percent identified as African-American. Sadler, who attended Barnard in the early ’70s and was the student founder of the Barnard Organization of Soul Sisters, agreed with Similien-Johnson and said that during her time at Barnard, her black identity was not valued in academic and social spaces on campus. Nonetheless, while reflecting on their experiences over the past five decades, spanning from the post-Brown v. Board of Education era of the early ’70s to the class of 2016, all the women on the panel expressed that their time at Barnard was a defining moment for their education, identity, and womanhood. Hawkins, a product manager at Goldman Sachs, stated that her experience at Barnard taught her to find critical thinking skills, resilience, and a sense of strength and empowerment within herself. All the women on the panel relayed a piece of advice to current students about the value of community and of sharing knowledge with other women. Groomes Katz, who is an attorney and immigration and citizenship lawyer, agreed and acknowledged the powerful legacy of Barnard women. In addition to the panel, other events in the Bold, Beautiful, Black @ Barnard series include an open mic night co-sponsored with WBAR that celebrated black queer narratives, an activist tribute and zine making workshop, and a film screening of Blasian Narratives in co-sponsorship with the Asian American Alliance on Wednesday at 7 p.m.